The Commonwealth Games is a great reminder to enjoy spectator sports but don’t forget to focus on your own inner athlete. Our sedentary lifestyles are catching up with us and it’s time to make a change. Here are some tips on how each of us can perform and live better by backing our own inner athlete through good spinal function, reducing pain, improving posture and taking care of our health. o	ACTIVATE PERFORMANCE by placing importance on good spinal health and function, alleviating pain, improving posture and mobility, and living a healthy lifestyle, to assist with improving performance in life. Back pain can result from injury, spinal abnormalities, degenerative conditions and even poor posture. o	Back pain is the third most common reason for taking time off work. extended periods of time can contribute to lower back problems. o	Parents are at risk of back problems due to lifting and twisting while carrying young children. o	Children are not immune to back problems. o	DIY and gardening can have an impact by placing stress on the back. o	In older people, postural issues can impact everyday activities. o	Chronic back pain can lead to a range of health issues that reduce mobility, quality of life and longevity, which in turn may cause depression. conditions, poor posture, stress, poor hydration and bad sleeping conditions. Due to the nature of the pain and its causes, a holistic approach is needed in most cases to re-educate and adjust the body to reignite their inner athlete. Chiropractors are trained and knowledgeable professionals who conduct adjustments that address the causes of pain rather than simply treating a symptom. Chiropractic care is individually based so discuss your specific needs with your chiropractor. Posture is the position in which we hold our bodies while standing, sitting or lying down. Your posture directly affects your health. Correcting bad posture does take discipline, but there’s no doubt the benefits are well worth the effort. The first step is understanding the bad posture habits our lifestyle may expose us to and then taking steps to address them. Poor posture may cause headaches, neck stiffness, back pain, fatigue, respiratory issues, poor digestion and tension by putting pressure on your spine. In many cases, this can be prevented with the correct education, adjustment and awareness of the issue. While it may take some diligence to undo bad habits, it’s worth persevering. o	Have an ergonomic assessment. If you have a desk job, this is essential in helping to maintain your spinal health. o	Bend your knees when lifting, not your back and try to avoid lifting heavy loads. o	Move regularly. Walking is a great start. 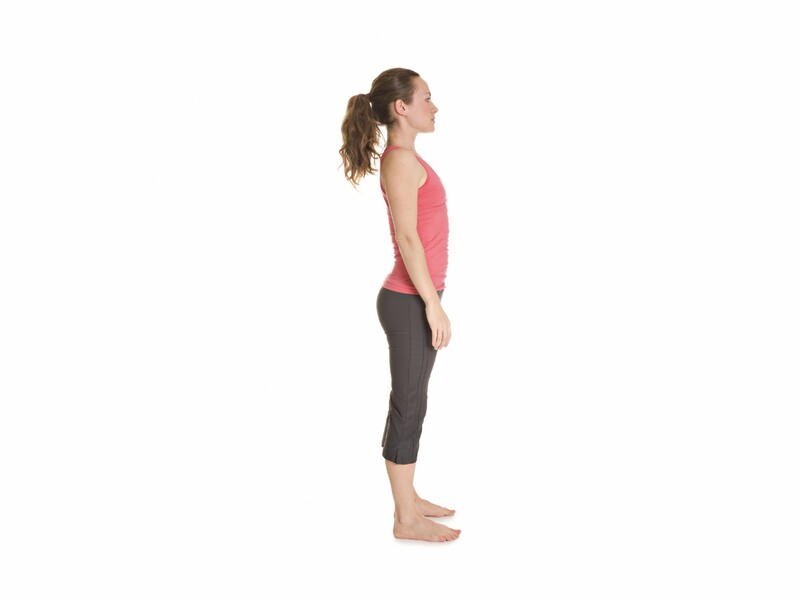 o	Try to maintain an upright posture with shoulders back and head in a neutral position. If you maintain an upright posture at all times you will put less stress on your spine. Building core muscles is critical to helping support your spine, which provides stability and protection. A good place to start is by simply walking regularly to boost mood, alertness and energy levels. It’s easy, accessible and free! You can integrate walking into your lifestyle by planning ahead, setting goals, using a pedometer, tracking ‘everyday’ activity, engaging your friends and rewarding yourself when you reach your goals. An active spine is a healthy spine, and a healthy spine leads to a healthier life. With the cooler autumn weather upon us it’s a great time to get back into gardening but don’t forget to protect your back and avoid injury by maintaining correct posture. It’s amazing how quickly the hours can slip by when you are bending over seeding, weeding and watering the garden. Not to mention digging, carrying buckets, pushing wheelbarrows and lifting. Done the wrong way, these activities can place strain on our backs, particularly when our bodies are held in unsound positions over a sustained period of time to perform these tasks. Round Shoulders is a condition that is often caused by hunching over, for example when weeding a garden. It is distinguished by the hunched over appearance it produces. Twisting to shift dirt from a wheelbarrow to a garden, or to pull out and pile up weeds can lead to issues with uneven or rotated hips. In severe cases, long term bad posture can lead to scoliosis, a condition that results in the spine twisting from left to right, instead of running in a straight line from top to bottom. Depending on the severity, scoliosis of the spine can have a detrimental impact on vital organs, such as your heart, liver and kidneys. The good news is that postural issues can be corrected and, in some instances, reversed. 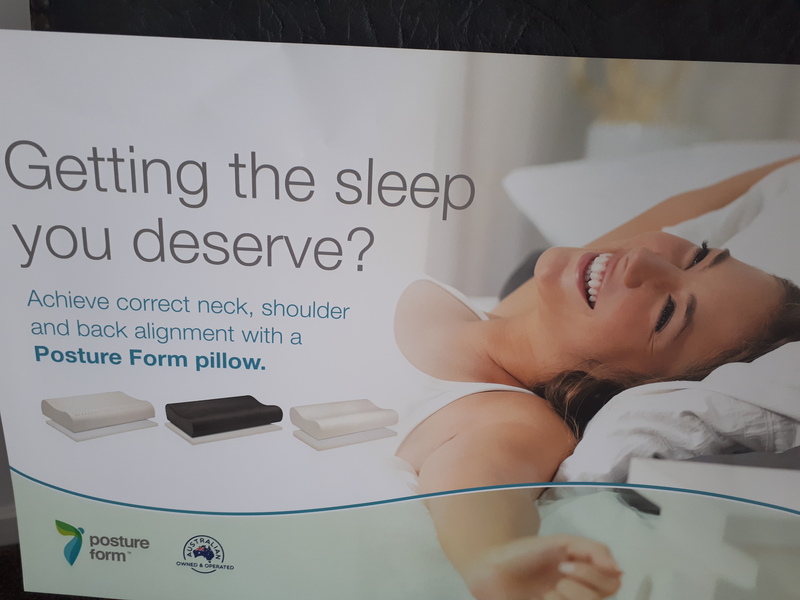 In the first instance, give your posture a sporting chance. By preparing before you enter the garden and having a few simple rules in mind, you can minimise your chance of experiencing some of these common gardening afflictions. –	Do some light stretching before you begin gardening to warm up your muscles and minimise the risk of injury. Even though gardening isn’t an extreme sport, injuries can still easily occur when muscles are too tight. –	Try to maintain a good posture as much as possible with a straight back and remember to pull your shoulders back and hold your head upright as much as possible. It is important to avoid rounding your shoulders or hunching over. –	Be careful not to twist your spine when transferring soil or other material from a wheelbarrow/stockpile to your garden and vice versa. Try to remember to keep your spine aligned in all of your movements and avoid jerky movements. –	Only take on loads that you can easily handle to reduce the risk of strain on your back. If a load it too heavy, either lighten the load or ask someone to help you. –	It is important to take frequent breaks, walk around and stretch, as staying in the same position for too long can contribute to a sore back later that night or the next morning. –	Drink plenty of water to keep you and your muscles well hydrated! If you do end up with a gardening injury, Lane Chiropractic can help. Contact us on 6676 2270 for an appointment. Need headache or migraine relief? If you have a headache, you’re not alone. Most Australians suffer from headaches. For many people this can happen on occasion but, for some, headaches can really impact their daily life. Headaches may range from a dull throbbing pain through to debilitating pain and nausea. While taking a pain relief tablet may alleviate symptoms for a short period of time, there is a better alternative to long-term headache relief. Headaches have many causes, or “triggers.” These may include dehydration by not drinking enough water, food intolerance, environmental stimuli (noises, lights, stress, etc.) and/or behaviours (insomnia, excessive exercise, blood sugar changes, etc.). About five percent of all headaches are warning signals caused by physical problems. 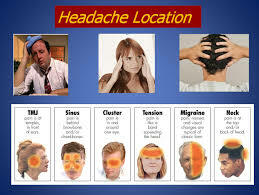 The remaining 95 percent of headaches are primary headaches, such as tension, migraine, or cluster headaches. These types of headaches are not caused by disease; the headache itself is the primary concern. Most primary headaches are associated with muscle tension in the neck. Australians now engage in more sedentary activities than in the past, and more hours are spent in one fixed position or posture (such as sitting in front of a computer or smart device). This can increase joint irritation and muscle tension in the neck, upper back and scalp, causing your head to ache. If you spend a large amount of time in one fixed position, such as in front of a computer, on a smart device, or reading, take a break and stretch every 20 minutes. The stretches should take your head and neck through a comfortable range of motion. While it is good to get up and move around, you can easily do this with some simple stretches in your office chair. Low-impact exercise may help relieve the pain associated with primary headaches. However, if you are prone to dull, throbbing headaches, avoid heavy exercise. Engage in such activities as walking and low-impact aerobic activities. Avoid teeth clenching. The upper teeth should never touch the lower teeth, except when swallowing. This results in stress at the temporomandibular joints (TMJ) – the two joints that connect your jaw to your skull – leading to TMJ irritation and a form of tension headache. Drink at least eight glasses of water a day to help avoid dehydration, which can lead to headaches. A 2014 report in the Journal of Manipulative and Physiological Therapeutics (JMPT) found that chiropractic care improved outcomes for the treatment of acute and chronic neck pain. A previous study also found that chiropractic care, including spinal manipulation, improved migraine and cervicogenic headaches. joint irritation and tension in the muscles of the neck and upper back. Chiropractors undergo extensive training to help relieve patients from pain. They know how tension in the spine relates to problems in other parts of the body, and they can take steps to address those problems. Our smart technology-dependent lifestyles can be a real pain in the neck, often causing a condition known as Text Neck. 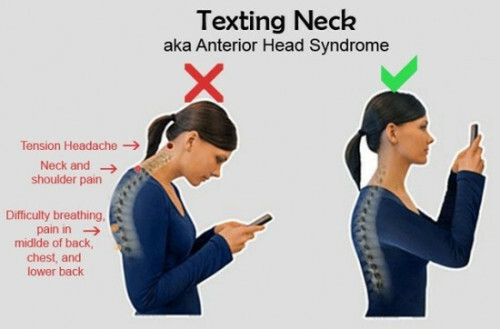 Text neck is the term used to describe the neck pain and damage sustained from looking down at your cell phone, tablet, or other wireless devices too frequently and for too long. And it seems increasingly common. Chiropractors are seeing more and more patients in practice complaining of severe upper back pain. Symptoms include severe, acute and upper back muscle strain. What are the symptoms associated with text neck? o	Upper back pain ranging from a chronic, nagging pain to sharp, severe upper back muscle spasms. o	Shoulder pain and tightness, possibly resulting in painful shoulder muscle spasm. o	If a cervical nerve becomes pinched, pain and possibly neurological symptoms can radiate down your arm and into your hand. Some studies suggest, text neck may possibly lead to chronic problems due to early onset of arthritis in the neck. A recent study shows that 79% of the population between the ages 18 and 44 have their cell phones with them almost all the time—with only 2 hours of their waking day spent without their cell phone on hand. o	Hold your cell phone at eye level as much as possible. The same holds true for all screens—laptops and tablets should also be positioned so the screen is at eye level and you don’t have to bend your head forward or look down to view it. o	Take frequent breaks from your phone and laptop throughout the day. For example, set a timer or alarm that reminds you to get up and walk around every 20 to 30 minutes. o	If you work in an office, make sure your screen is set up so that when you look at it you are looking forward, with your head positioned squarely in line with your shoulders and spine. Whether it’s the beach, a barbie or backyard cricket, Australia Day is all about relaxing and having fun with your mates. 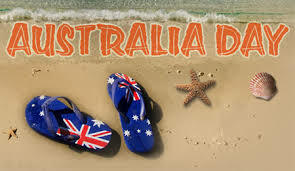 Whatever you plan to do to celebrate our special Aussie Day, make sure you take care of your back with these Australia Day Survival Tips from Bruce Lane of Lane Chiropractic. While a day off is a great excuse for lying on the couch, make sure you get at least 30 minutes of exercise per day to keep your back and your whole system moving. It’s particularly important to keep moving and activating your core stabilising muscles to support your back. 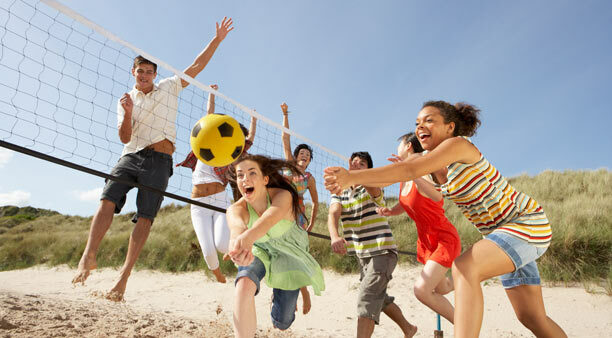 This time of year we can get a bit too excited about backyard games and beach fun. It’s during this time that I find people will often over extend muscles, especially when they haven’t been exercising much previously, and put their backs out. If you feel pain, it’s your body’s way of telling you to stop. Make sure that when you are having fun, listen to your body and its limits. Be careful about how much you lift and watch your lifting technique. On a day when we often fill our eskies for parties, we can forget correct lifting techniques. Make sure you bend your knees and lift with a straight back. Use your legs to take the load, not your back. If the load feels too heavy, get someone to help you. Watch for stress injuries. Our backs take a lot of strain a lot of the time. Most of the time they are pretty tough and don’t let us know that we are pushing things too far. Think about how your daily activities impact your back (even too much inactivity can impact your back). Be mindful of how your back feels and how you can relieve stress on it. •	Use back support, such as a small, rolled towel. Alternate behind the back and then between the shoulders. •	Sit upright with your head back before setting the position of your mirrors. This will remind you not to slouch. •	Stay well hydrated, sip water often. •	Pillows are light, so take a supportive pillow with you. •	Put your seat upright and ensure your tailbone is as far back in the seat as it can be, with shoulders and head as supported as possible by the seat. If you are travelling by plane, most of these tips apply. In addition, where possible sit in an aisle seat to make it easier to regularly stretch and walk during the flight. Be careful lifting suitcases. Bend with your knees, not your back. Also, regularly roll your ankles in circles and point then flex your feet to reduce the risk of deep vein thrombosis. If you are sleeping away from home this weekend here are some tips to protect your back and give you a good night’s sleep. 1. Sleep on your back or side as much as possible, avoid sleeping on your stomach! 2. If the bed is ‘saggy’, consider putting the mattress on the floor. 3. Use a ceiling fan instead of air-conditioning where possible to avoid cold blasts of air on your neck or back. 4. Compensate for dips in the mattress by placing a small, soft towel under your side. 5. Always stretch after sleeping. 6. Stay well hydrated, sip water often – but not too much before bed otherwise you will be up in the night! Lane Chiropractic has you covered this Australia Day long weekend. We are open on Saturday, 27th and Sunday 28th if you find you need help to get your body back in alignment before the working week. Sleep, we all need it but what happens when you aren’t getting enough? Apart from making us feel lousy, a lack of sleep can have some quite serious health impacts. Personal safety: If you don’t get sufficient sleep you place yourself and others at risk of work-related injuries and road accidents. Mood: Without a good night’s sleep a person can feel very irritable, impatient and generally a bit emotional. Being able to concentrate on tasks becomes a challenge, which further impacts an already negative emotional state. Learning and memory: The more tired you are the more you will struggle with learning new information as well as general memory function. Cardiovascular health: Those with serious sleep disorders are at high risk of hypertension, irregular heartbeat and increased stress hormones. Disease: The more sleep we lose the weaker our immune system becomes, which makes us more vulnerable to illness and disease. Weight gain: Scientists have found a direct link between chronic sleep deprivation and weight gain because the body’s ability to process and store carbohydrates alters with continued lack of sleep. Some studies indicate that there is an increase in levels of cortisol (stress hormone) when the body’s circadian rhythms are disturbed. When these levels remain high for a prolonged period of time, bone density reduces as well as muscle mass. The immune system weakens, fat accumulates in the abdomen area and it impacts the functioning of the thyroid gland. Our body replenishes: Sleep is when our body goes into repair mode. Cells produce more protein, which is used to repair any damage while we sleep. Muscle injuries and other trauma heals faster while we are asleep. Decreases depression: Without adequate sleep our body is not able to properly regulate serotonin levels. When our serotonin levels are where they should be we feel happy and we’re more productive. Reduces chronic inflammation: Some studies suggest that there is an association with chronic inflammation disorders and the increase of stress hormones caused by the lack of sleep. Some of these chronic inflammation disorders include atherosclerosis, rheumatoid arthritis, heart conditions and cancer. Reduces stress: When we lack sleep our body enters a state of stress. Blood pressure increases, which increases the risk of heart attack and stroke. A good night’s sleep can break the cycle of stress and counteract health impacts caused by stress. Keeps our heart healthy: If we get 7-9 hours of sleep a night this significantly reduces the risk of heart disease and stroke. Reduce environmental factors: Cutting back on stressors on the body, such as alcohol, cigarettes, caffeine and sugar, can help to improve sleep patterns. Try to get some exercise: Even 20 or 30 minutes of exercise a day will help your body to relax more when you are ready for bed. Develop a sleep pattern: This is even true for shift workers. Develop a nightly (or daily) pattern that helps you wind down. It may be as simple as a cup of warm milk, some soft music or five minutes of quiet time just before bed. Over time this will help signal to your body that it’s time for sleep. Stop screen time: It has been proven that working on smartphones, computers and other smart devices impacts the body’s ability to wind down. Even television impacts our ability to sleep. Try to turn off all of these devices at least an hour before bed. Drink plenty of water: Drinking plenty of water throughout the day will help to flush your kidneys and generally cleanse your whole system. Just don’t drink too much before bedtime otherwise you will be up in the night! Have good bedding: If your mattress and pillow are too soft or too hard it will impact your ability to sleep. Find the right mattress and pillow that will provide proper support for you so that you can feel comfortable all night long and wake up feeling great too. Sleeping pills are not recommended because, even if they work, they are only masking the real problem and may cause side effects. Chiropractic care can help you get the sleep you need. This type of treatment improves the blood flow in the nervous system and it corrects any misalignments or subluxations in the spine that may be causing your sleep problems. Subluxations compress the nerve, which causes a lack of communication between the spine and the brain. This can lead to a stress response that puts the body out of balance, so sleep becomes a challenge. This can be easily treated with chiropractic care. Regular chiropractic care can also solve several other problems that may be the cause of sleepless nights such as back pain, breathing problems, and restless leg syndrome. Many people are thrilled with how well their sleep has improved after getting regular wellness adjustments. Regular chiropractic care has been shown to improve the symptoms and conditions of insomnia patients by helping them to sleep better and, as a result, improve the quality of their daily life. Chiropractors can also provide advice and assistance with supportive mattresses and pillows. Chiropractic care isn’t just for adults suffering with sleep disorders; children can also greatly benefit from chiropractic treatment. Many of us put on some extra kilos over the festive season and we can often find it difficult to shed that extra bit of weight. The best and easiest thing you can do is to start a simple exercise program and stick to it. Easier said than done right? Believe it or not, it’s actually quite easy to fit exercise into your daily routine. Here’s a great article from helpguide.org that gives really good advice about how to start an exercise program that you will easily be able to maintain. If you have any medical concerns about starting a new exercise program it’s always wise to visit your chiropractor to get the best advice on exercise that is appropriate for you. What’s keeping you from exercising? If you’re having trouble beginning an exercise plan or following through, you’re not alone. Many of us struggle getting out of the sedentary rut, despite our best intentions. While practical concerns like a busy schedule or poor health can make exercise more challenging, for most of us, the biggest barriers are mental. Maybe it’s a lack of self-confidence that keeps you from taking positive steps, or your motivation quickly flames out, or you get easily discouraged and give up. We’ve all been there at some point. Ditch the all-or-nothing attitude. You don’t have to spend hours in a gym or force yourself into monotonous or painful activities you hate to experience the physical and emotional benefits of exercise. A little exercise is better than nothing. In fact, adding just modest amounts of physical activity to your weekly routine can have a profound effect on your mental and emotional health. Be kind to yourself. Research shows that self-compassion increases the likelihood that you’ll succeed in any given endeavor. So don’t beat yourself up about your body, your current fitness level, or your supposed lack of willpower. All that will do is demotivate you. Instead, look at your past mistakes and unhealthy choices as opportunities to learn and grow. Check your expectations. You didn’t get out of shape overnight, and you’re not going to instantly transform your body either. Expecting too much, too soon only leads to frustration. Try not to be discouraged by what you can’t do or how far you have to go to reach your fitness goals. Instead of obsessing over results, focus on consistency. While the improvements in mood and energy levels may happen quickly, the physical payoff will come in time. Making excuses for not exercising? Whether it’s lack of time, energy, or fear of the gym, there are solutions. Many of us feel the same. If sweating in a gym or pounding a treadmill isn’t your idea of a great time, try to find an activity that you do enjoy—such as dancing—or pair physical activity with something more enjoyable. Take a walk at lunchtime through a scenic park, for example, walk laps of an air-conditioned mall while window shopping, walk, run, or bike with a friend, or listen to your favorite music while you move. Even the busiest of us can find free time in our day for things that are important. It’s your decision to make exercise a priority. And don’t think you need a full hour for a good workout. Short 5-, 10-, or 15-minute bursts of activity can be very effective—so, too, can be squeezing all your exercise into a couple of sessions at the weekend. If you’re too busy during the week, get up and get moving at the weekends when you have more time. It may sound counterintuitive, but physical activity is a powerful pick-me-up that actually reduces fatigue and boosts energy levels in the long run. With regular exercise, you’ll feel much more energized, refreshed, and alert at all times. It’s never too late to start building your strength and physical fitness, even if you’re a senior or a self-confessed couch potato who has never exercised before. Very few health or weight problems make exercise out of the question, so talk to your doctor about a safe routine for you. Still have nightmares from PE? You don’t have to be sporty or ultra-coordinated to get fit. Focus on easy ways to be more active, like walking, swimming, or even working more around the house. Anything that gets you moving will work. Current recommendations for most adults is at least 150 minutes of moderate activity per week. You’ll get there by exercising for 30 minutes, 5 times a week. Can’t find 30 minutes in your busy schedule? It’s okay to break things up. Two 15-minute workouts or three 10-minute workouts can be just as effective. And a recent study in the UK found that squeezing a week’s worth of activity into one or two sessions at the weekend can be almost as beneficial for your health as spreading it out over the week. How hard do I need to exercise? For most people, moderate exercise is the most beneficial for overall health; you don’t need to keep intensifying your workouts or sweat buckets. In fact, exercising too strenuously can sometimes lead to diminishing returns on your fitness levels or cause injuries or other problems. While everyone is different, don’t assume that training for a marathon is better than training for a 5K or 10K. There’s no need to overdo things. Health issues? Get medical clearance first. If you have health concerns such as heart disease, asthma, diabetes, or high blood pressure, talk with your doctor before you start to exercise. Warm up. Warm up with dynamic stretches—active movements that warm and flex the muscles you’ll be using, such as leg kicks, walking lunges, or arm swings—and by doing a slower, easier version of the upcoming exercise. If you’re going to run, start with walking, for example. Or if you’re lifting weights, begin with a few light reps. Cool down. After your workout, it’s important to take a few minutes to cool down and allow your heart rate to return to its resting rate. A light jog or walk after a run, for example, or some gentle stretches after strength exercises can also help prevent soreness and injuries. Drink plenty of water. Your body performs best when it’s properly hydrated. Failing to drink enough water when you are exerting yourself over a prolonged period of time, especially in hot conditions, can be dangerous. There’s a reason so many New Year’s resolutions to get in shape crash and burn before February rolls around. And it’s not that you simply don’t have what it takes. Science shows us that there’s a right way to build habits that last. Follow these steps to make exercise one of them. If your workout is unpleasant or makes you feel clumsy or inept, you’re unlikely to stick with it. Don’t choose activities like running or lifting weights at the gym just because you think that’s what you should do. Instead, pick activities that fit your lifestyle, abilities, and taste. A goal of exercising for 30 minutes a day, 5 times a week may sound good. But how likely are you to follow through? The more ambitious your goal, the more likely you are to fail, feel bad about it, and give up. It’s better to start with easy exercise goals you know you can achieve. As you meet them, you’ll build self-confidence and momentum. Then you can move on to more challenging goals. Triggers are one of the secrets to success when it comes to forming an exercise habit. In fact, research shows that the most consistent exercises rely on them. Triggers are simply reminders—a time of day, place, or cue—that kick off an automatic reaction. They put your routine on autopilot, so there’s nothing to think about or decide on. The alarm clock goes off and you’re out the door for your walk. You leave work for the day and head straight to the gym. You spot your sneakers right by the bed and you’re up and running. Find ways to build them into your day to make exercise a no-brainer. People who exercise regularly tend to do so because of the rewards exercise brings to their lives, such as more energy, better sleep, and a greater sense of well-being. However, these tend to be long-term rewards. When you’re starting an exercise program, it’s important to give yourself immediate rewards when you successfully complete a workout or reach a new fitness goal. Choose something you look forward to, but don’t allow yourself to do until after exercise. It can be something as simple as having a hot bath or a favorite cup of coffee. Schedule it. You don’t go to important meetings and appointments spontaneously, you schedule them. If you’re having trouble fitting exercise into your schedule, consider it an important appointment with yourself and mark it on your daily agenda. Make it easy on yourself. Plan your workouts for the time of day when you’re most awake and energetic. If you’re not a morning person, for example, don’t undermine yourself by planning to exercise before work. Remove obstacles. Plan ahead for anything that might get in the way of exercising. Do you tend to run out of time in the morning? Get your workout clothes out the night before so you’re ready to go as soon as you get up. Do you skip your evening workout if you go home first? Keep a gym bag in the car, so you can head out straight from work. Hold yourself accountable. Commit to another person. If you’ve got a workout partner waiting, you’re less likely to skip out. Or ask a friend or family member to check in on your progress. Announcing your goals to your social group (either online or in person) can also help keep you on track. As previously mentioned, you are much more likely to stick with an exercise program that’s fun and rewarding. No amount of willpower is going to keep you going long-term with a workout you hate. Does the thought of going to the gym fill you with dread? If you find the gym inconvenient, expensive, intimidating, or simply boring, that’s okay. There are many exercise alternatives to weight rooms and cardio equipment. For many, simply getting outside makes all the difference. You may enjoy running outdoors, where you can enjoy alone time and nature, even if you hate treadmills. Activity-based video games such as those from Wii and Kinect can be a fun way to start moving. So-called “exergames” that are played standing up and moving around—simulating dancing, skateboarding, soccer, bowling, or tennis, for example—can burn at least as many calories as walking on a treadmill; some substantially more. Once you build up your confidence, try getting away from the TV screen and playing the real thing outside. Or use a smartphone app to keep your workouts fun and interesting—some immerse you in interactive stories to keep you motivated, such as running from hordes of zombies! Think about activities that you enjoy and how you can incorporate them into an exercise routine. Watch TV as you ride a stationary bike, chat with a friend as you walk, take photographs on a scenic hike, walk the golf course instead of using a cart, or dance to music as you do household chores. Exercise can be a fun time to socialize with friends and working out with others can help keep you motivated. For those who enjoy company but dislike competition, a running club, water aerobics, or dance class may be the perfect thing. Others may find that a little healthy competition keeps the workout fun and exciting. You might seek out tennis partners, join an adult soccer league, find a regular pickup basketball game, or join a volleyball team. Family walks in the evening if weather permits. Infants or young children can ride in a stroller. Blast upbeat music to boogie to while doing chores as a family. Seasonal activities, like skiing or ice skating in the winter and hiking, swimming, or bicycling in the summer can both make fun family memories and provide healthy exercise. Instead of zoning out or distracting yourself when you exercise, try to pay attention to your body. By really focusing on how your body feels as you exercise—the rhythm of your breathing, the way your feet strike the ground, your muscles flexing as you move, even the way you feel on the inside—you’ll not only improve your physical condition faster but also interrupt the flow of worries or negative thoughts running through your head, easing stress and anxiety. Exercising in this way can also help your nervous system become “unstuck” and begin to move out of the immobilization stress response that characterizes PTSD and trauma. Exercises that engage both your arms and legs—such as walking (especially in sand), running, swimming, weight training, rock climbing, skiing, or dancing—are great choices for practicing mindfulness. If you’re not the kind of person who embraces a structured exercise program, try to think about physical activity as a lifestyle choice rather than a task to check off your to-do list. Look at your daily routine and consider ways to sneak in activity here and there. Even very small activities can add up over the course of a day. Make chores count. House and yard work can be quite a workout, especially when done at a brisk pace. Scrub, vacuum, sweep, dust, mow, and weed—it all counts. Look for ways to add extra steps. Take the stairs instead of the elevator or escalator. Park farther from the entrance, rather than right out front. Get off your train or bus one stop early. The extra walking adds up. Ditch the car whenever possible. Instead of driving everywhere, walk or bike instead when the distance is doable. Move at work. Get up to talk to co-workers, rather than phoning or sending an email or IM. Take a walk during your coffee and lunch breaks. Use the bathroom on another floor. Walk while you’re talking on the phone. Exercise during commercial breaks. Make your TV less sedentary by exercising every time commercials come on or during the credits. Options include jumping jacks, sit-ups, or arm exercises using weights. Owning a dog leads to a more active lifestyle. Playing with a dog and taking him for a walk, hike, or run are fun and rewarding ways to fit exercise into your schedule. Studies have shown that dog owners are far more likely to meet their daily exercise requirements than non-owners. One year-long study found that walking an overweight dog helped both the animals and their owners lose weight (11 to 15 pounds). Researchers found that the dogs provided support in similar ways to a human exercise buddy, but with greater consistency and without any negative influence. Public housing residents who walked therapy dogs for up to 20 minutes, five days a week, lost an average of 14.4 pounds in a year, without changing their diets. If you’re not in a position to own a dog, you can volunteer to walk homeless dogs for an animal shelter or rescue group. You’ll not only be helping yourself but also be helping to socialize and exercise the dogs, making them more adoptable. For more on how owning a dog can make you healthier and happier, see: The Mood-Boosting Power of Dogs. No matter how much you enjoy an exercise routine, you may find that you eventually lose interest in it. That’s the time to shake things up and try something new or alter the way you pursue the exercises that have worked so far. Pair your workout with a treat. For example, you can listen to an audiobook or watch your favorite TV show while on the treadmill or stationary bike. Log your activity. Keep a record of your workouts and fitness progress. Writing things down increases commitment and holds you accountable to your routine. Later on, it will also be encouraging to look back at where you began. Harness the power of the community. Having others rooting for us and supporting us through exercise ups and downs will help keep motivation strong. There are numerous online fitness communities you can join. You can also try working out with friends either in person or remotely using fitness apps that let you track and compare your progress with each other. Get inspired. Read a health and fitness magazine or visit an exercise website and get inspired with photos of people being active. Sometimes reading about and looking at images of people who are healthy and fit can motivate you to move your body. Even the most dedicated exercisers sometimes go astray. Almost anything can knock you off track: a bad cold, an out of town trip, or a stretch of bad weather. That’s why it’s important to learn how to reclaim your routine. When you’ve missed workout sessions, evaluate your current level of fitness and goals accordingly. If you’ve been away from your routine for two weeks or more, don’t expect to start where you left off. Cut your workout in half for the first few days to give your body time to readjust. Imagine yourself exercising. Recall the aspects of exercise you enjoy most. Come up with a tantalizing reward to give yourself when you meet your first goal after resuming your program. Line up walking partners for your next few outings. If completing your whole exercise routine seems overwhelming, mentally divide it into smaller chunks, and give yourself the option of stopping at the end of each one. However, when you reach a checkpoint, encourage yourself to move on to the next one instead of quitting. Rather than focus on why you don’t want to exercise, concentrate on how good you feel when you’ve finished a workout. Adapted with permission from Starting to Exercise, a special health report published by Harvard Health Publications. Many of us love to make New Year’s resolutions but how many of these resolutions do we actually keep? Here’s a quick guide to seven healthy resolutions that you can easily keep in 2018. 1. Get at least 30 minutes of daily exercise. Many of the benefits of regular exercise can be experienced with as little as 30 minutes of physical activity a day. Not only will you decrease your risk of obesity and diabetes, you’ll also experience a reduction in back pain, migraine, and other neuro-musculoskeletal symptoms. Feel like you don’t have time? Try doing a 30 minute swim, a walk or even just some nice gentle stretching while watching TV. You can even do a five minute walk a few times a day around the office to get you up and moving away from your computer. 2. Deep breathing. Believe it or not, many of us often forget to breathe, especially when feeling stressed. This can make us more stressed and can promote illness because breath is fundamental to life. Meditation, going on walks, and taking breaks throughout the day can all aid in stress reduction. Lowering your stress can make your immune system more resilient and decrease chronic pain flare-ups. If you do feel stressed of overwhelmed, just remember to deep breathe and feel the immediate calming effects. 3. Laugh more often. Laughter doesn’t just relieve mental stress; it also fires off a cascade of physical reactions that benefit your health. Studies show that laughing can stimulate the heart, muscles, and lungs— not to mention the flurry of endorphins that are released after a good giggling session. Laughing is a natural way to anti-age, so laugh your way to being young again. 4. Eat your greens. Vegetables like broccoli and kale, which are rich in calcium, can help to decrease your risk of osteoarthritis. Spinach, lentils, and beans are high in magnesium, a vitamin shown to benefit patients with back pain. Wherever possible, try to buy spray free vegetables or even grow your own and save money. 5. Quit smoking. Cigarette smoking increases your risk of spinal conditions and arthritis. Smoking cessation has been linked to an improvement in spinal pain. As a bonus, new research shows that smokers who attempt to quit in January are more successful because of the extra motivation the New Year provides. If part of your New Year’s resolution is to save money, imagine how much you would save by quitting smoking. You could use that money to take yourself on a fantastic holiday at the end of the year. 6. Lose weight. Carrying extra weight increase the load on your spine and joints, making you more susceptible to sciatica, disc herniation, and osteoarthritis. The key to losing weight is patience. Don’t just jump on the latest fad diet in the hope of rapid weight loss. You may lose the weight initially but then it can easily pile back on once you return to your normal eating habits. Perhaps a better resolution to losing weight is changing to a healthy diet. Making a lifestyle change to a healthier way of eating provides for more sustainable weight loss. 7. See a chiropractor. The spine plays an important role in your overall health by ensuring that your nervous system is functioning smoothly. As spinal specialists, chiropractors relieve pain from spinal conditions and assist in improving your overall health. Research has shown that chiropractic adjustments reduce the stress hormone cortisol and boost the presence of infection-fighting antibodies in the body. Another year has flown by and Christmas is upon us again. As much as we love the holiday season it can take its toll on our bodies, in particular our spine and nervous systems. Whether it is overindulging in a bit too much Christmas cheer, or dragging heavy pressies around the shops while stressing if you have everything organised in time for Christmas day, our bodies are under a lot of pressure over the busy Christmas period. To help you survive the silly season here are some simple Christmas and New Year survival health tips. • Keep moving! Go for a walk or do some of your daily stretching exercises and make it a regular part of your holiday period. With the warmer weather upon us it’s even a great time for a swim to get those muscles really moving without putting too much strain on your body. • Leave Santa and his reindeer some fresh fruit and water with lemon, not chocolate or beer. We’re pretty sure he’ll have enough of those things on Christmas day. As much as possible, reduce chemical stressors that affect Santa’s vital spine and nervous system. • Remember to maintain good posture and use correct lifting techniques when carrying heavy gifts at the shops or at home. Even a whole bunch of small gifts can become quite a big weight for the body to carry, so take special care of your back. • If doing things you don’t normally do, like a spring clean, renovation or gardening, remember to take it easy and listen to your body for any warning signs such as any stiffness or pain. Pain is your body’s way of telling you something is wrong so stop what you are doing and rest until your body recovers. 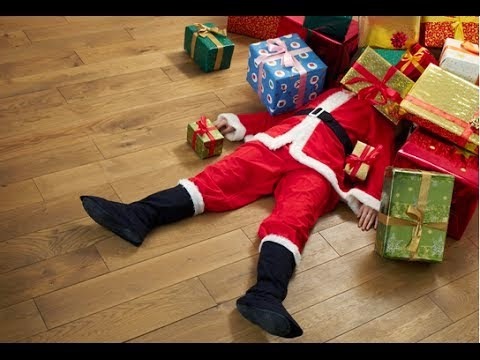 It’s better to not finish that gardening project or spring clean, or ask someone else to help you, rather than end up flat on your back on Christmas day. • Just because it’s Christmas does not mean you have to eat the whole pavlova or the whole cheesecake. Remember everything in moderation, and try to keep to a normal everyday routine. According to ‘Nutrition Australia’ we put on an average of 0.8-1.5kg over the xmas period. It could take weeks just to shed those kilos again and they put extra strain on your spine. • Make an alcohol deal with yourself! Don’t have any more than you would have had normally if it wasn’t Christmas. Alcohol only dehydrates you and has vast negative effects on your health and wellbeing. If you do decide to drink, try to substitute every second glass with a glass of water to keep yourself well hydrated, which is particularly important in summer given that our bodies lose so much water trying to keep ourselves cool in the hot weather. • Anxiety, depression and stress are very common during the festive season. Take some time out for either yourself or your immediate family. Whether it is a hobby, a nice dinner at home or a quiet getaway. Also, playing your favourite music, meditation and yoga can all help to ease stress. Stress has a direct impact on your nervous system and on your spine so take it easy. • Get enough sleep. Plan for some early nights in as the silly season can cause havoc with our sleeping routines. If you do feel a little tired during the day, try to catch a 10 – 15 minute catnap if possible to give you that extra bit of energy until you can get your sleeping patterns back on track. Lane Chiropractic has you covered over Christmas and will be open every day over the Christmas break, except for Christmas Day and New Year’s Day. We accept HICAPS for immediate claims on health funds, and remember you have until December 31 to claim for this year’s health rebates on most health funds so it’s a great time to use the benefit before you lose it. We also accept the GP referral program. For an appointment call us on 6676 2270. Merry Christmas and a safe and happy holiday to everyone. Paying attention to your side profile could help avoid neck and back problems and improve quality of life. New research published by the British Chiropractic Association (BCA) suggests that those whose heads lean forward are most likely to be currently suffering from back or neck pain (58%), followed by those with an excessively arched lower back (56%). The BCA researchers asked women (whom the study was focused on) which side-shape they are, with four broad categories of altered posture compared to the ideal. Whether you stand like a spoon or a leaning tower, a bridge or a flat back, your side-shape may indicate problems ahead. Posture has also been shown to have an effect on many other areas of health and wellbeing beyond symptoms of pain such as mood, energy levels, self-confidence, range of motion, and change in the release of stress hormones. Poor posture can also negatively impact on decision making, work productivity and other areas of life. The good news is that making changes to your posture doesn’t call for extreme dieting or exercise programs and can be managed simply with the help of your local chiropractor. People who want to improve their back and neck pain symptoms through a better posture should try imagining they have a plumb line hanging straight from their ears to ankles – with everything in the middle sitting on the same line. One way to do this is to try standing in a relaxed way and then gently contracting the abdominal muscles. When sitting, the gravity line should pass thorough ear, shoulder and hip. We have an wholistic and personalised approach to your treatment. As part of this approach we have a good network of local medical doctors, podiatrists, acupuncturists and other health specialists to best meet your needs when necessary.